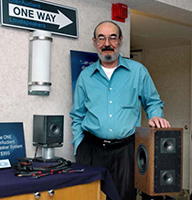 Audience’s chief design engineer, Roger Sheker, stands between two very overachieving new speakers, The ONE, on the short stand atop the counter to the left, and the 2+2, on which he is resting his hand to the right. 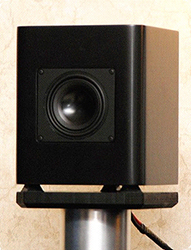 Like all of the Audience ClairAudient line of loudspeakers, they are based on the astonishing Audience A-3S driver, a remarkable little 3-inch driver, and are therefore crossover-less. I have to say that at $995, The ONE, using one A-3S driver on the front, acoustically coupled to a single passive driver on the rear face, is going to set a high standard of overall performance. I expected it to be good, but it was truly stunning, quite competently filling the good-sized suite occupied by Audience on the fourth floor of the Flamingo! 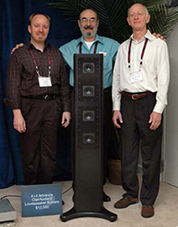 From left to right, Dan Rosca, Vice-president of Sales and Marketing, Roger Sheker, Chief design engineer, and John McDonald, President and CEO of Audience, stand behind the new ClairAudient 4+4, which should sell for around $12,500. I only had one word for the way it performed in their nicely sized suite in the Flamingo, “F**k,” and they plan to quote me! The speaker is amazingly transparent, with goose-bump generating dynamics, and a naturalness that is rare at any price, let alone the $12.5K price point! The new Clairaudient desktop speakers (by Audience) were dropping jaws all day. There are single driver speakers and there are mini monitors. Combine the two and add some battery supplied power by Virtue Audio and WOW! 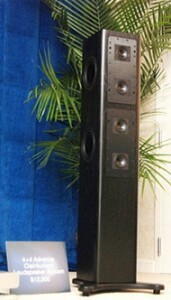 The phase coherence of a single driver and the size of the cabinet made for an eerily realistic soundstage.